10 Best Things To Do on Your First Visit to Vancouver! Vancouver BC ranks up there as one of my favorite city break destinations. It is vibrant, cosmopolitan, fun, and beautiful. What’s not to love? If you are planning a first ever trip to this lovely Canadian destination, you’ll be spoiled for choice on things to do. Read on to discover my list of the 10 best things to do on your first visit to Vancouver! Vancouver is that special city that offers something of interest to every type of traveler. If you love photography, its stunning skylines, beautiful boats, vibrant neighborhood streets and gorgeous green spaces provide tons of photo ops. An outdoors enthusiast? You can tackle the Grouse Grind, or walk/bike the Seawall. A foodie? You can sample every type of cuisine at eateries that run the gamut from upscale establishments to hole-in-the-wall ramen shops. On your first visit, you’ll want a taste of everything the city has to offer, from must-see sights to great eats, from walks through the most inviting neighborhoods to a sampling of outdoor adventures. Head to the Harbour Centre to take the external glass elevator 553 feet up to the observation deck of the Vancouver Lookout. Taking in the breathtaking views from the Lookout is definitely one of the best thigs to do on your first visit to Vancouver! The deck offers 360-degree views of the city and surroundings, with plaques to describe each view. There’s a lounge where you can hang out. Your paid admission is valid for the day, so get your hand stamped and return in the evening to watch the sun set behind the mountains and the lights come on all over the city. Pure magic! 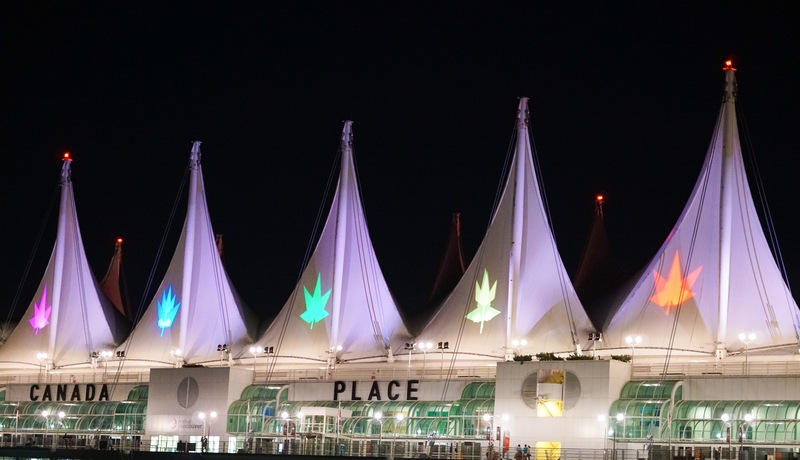 The Canada Place waterfront is a great place for an evening stroll. Wait in line (there’s always a line!) at Bella Gelateria at the corner of Burrard and W. Cordova and get some delicious award-winning gelato to go. Then stroll over to look at the sails of Canada Place, lit up in beautiful bright colors, and the lights of North Vancouver across the water. Next to the Convention Centre, right next to the water, is the Digital Orca, a giant statue of a killer whale by Douglas Coupland. It looks like it’s made of Lego blocks. Here also is the enormous Olympic Torch, sometimes lit for special events. If you have the time, take in a showing of FlyOver Canada, a thrilling film that adds in special effects to make you feel like you are in the plane flying over Canada’s beautiful scenery. Wind, mist spray and scents are added to make the experience even more “real.” I loved the film, although my husband found it a little too thrilling and shut his eyes through much of it!!! 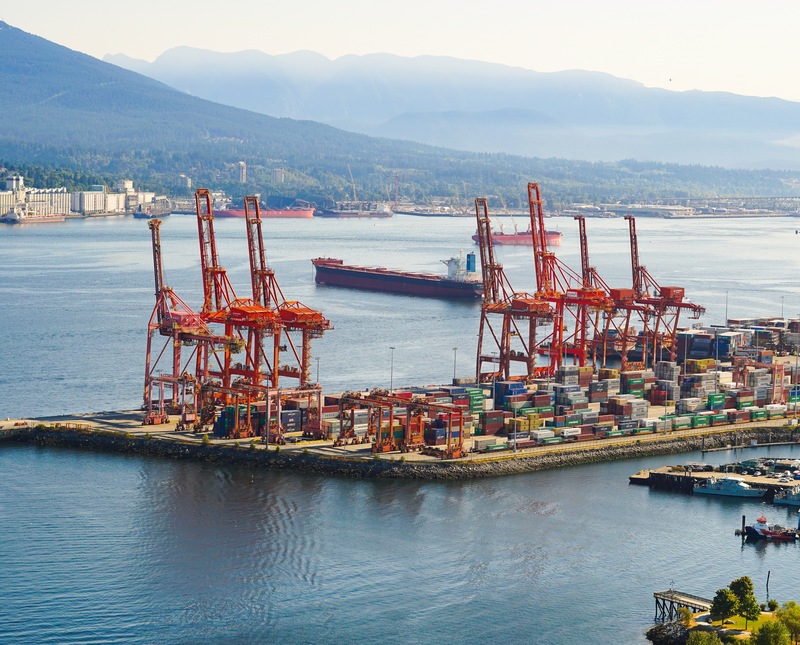 The Vancouver Seawall is a long waterfront walkway, more than 13 miles long! It’s nice and wide, with a section for walkers/joggers closer to the water and another for bikers/skaters on the inside. Many sections of the Seawall are ridiculously scenic, particularly near English Bay and along Stanley Park. The Brockton Point Lighthouse is a great place to stop and take in views of the Lions Gate Bridge. Take a look at the Nine o’Clock gun nearby: it’s still fired every night! Other popular sights along the wall are the statue of the Girl in a Wetsuit and the stunning Siwash Rock. The Wall is incredibly popular so start out early for some quiet chill time. Take plenty of water and sunscreen and enjoy the fresh air and the beautiful views! I took the photos below on the section along Stanley Park from the Totem Poles going towards Coal Harbor. A 1,001-acre public park just outside downtown, Stanley Park is a delight to explore. It contains than half a million trees, many of them really really old and tall. You can watch a game of cricket on the green, wander the rose garden, marvel at the Totem Pole display at Brockton Point, take a ride on a horse-drawn carriage, or pose for a photo in the Hollow Tree. The Vancouver Aquarium is in this park, and there’s also a polar bear exhibit and a miniature train. The park is huge so visit with a plan. You want to be able to comfortably complete the sections that appeal the most to you. There is a shuttle that operates in the Park, but service is reportedly sketchy and not timely, so plan on having to wait if you decide to take it. See the Steam Clock in Gastown! Gastown is a really cool neighborhood, with lots of boutique stores, art galleries, restaurants and nightclubs. 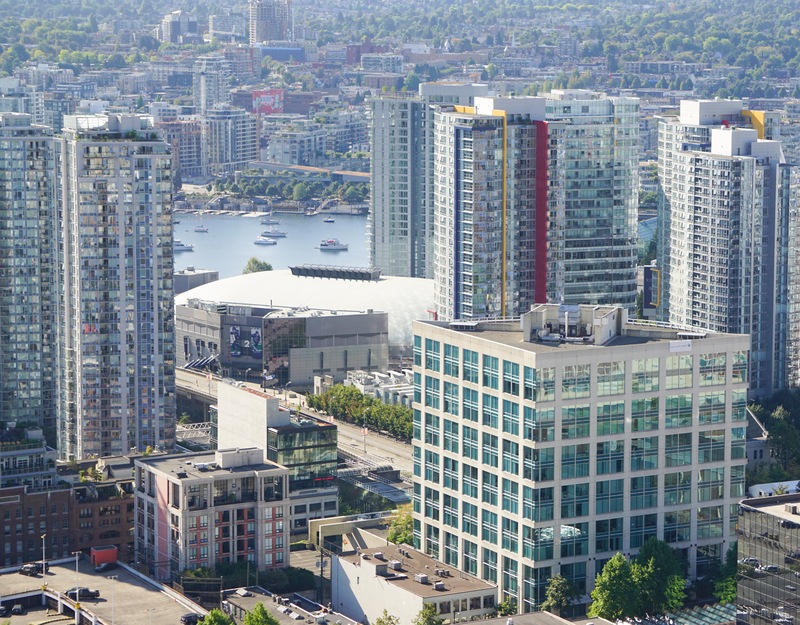 It is the original settlement that eventually became Vancouver, so you’ll be living history when you walk the streets of this now trendy neighborhood. On the corner of Cambie and Water Street is Gastown’s main claim to tourist fame: a steam-powered clock that actually lets out steam and toots! Visit at night to see the surrounding buildings lit up. The Aquabus is a cute colorful water taxi that provides services along False Creek. We bought day passes and used the Aquabus to hop over from downtown to Granville Island. Later, we rode it up and down False Creek to visit different spots along the shore, including Yaletown, the Olympic Village, Plaza of Nations and Science World. On a beautiful day, the Aquabus is the perfect way to capture lots of great photos of the skyscrapers along the shore, as well as the boats and bridges. This was one of the most fun parts of our visit for me. Across False Creek from downtown Vancouver is Granville Island. You can cross over using the Aquabus or False Creek Ferries, or you can drive across the Granville Bridge. The big draw here is the Public Market, a foodie paradise. But the neighborhood is fun to explore as well, with lots of art galleries, “workshop windows” that offer opportunities to watch artisans at work, street performers, and theaters. Check out Giants, a gorgeous mural on six concrete silos by Osgemeos. It’s currently the largest public artwork in Canada. You can see the mural from the Sandbar, the seafood place right next to the Public Market. Wrap up your visit to Granville Island at the Public Market, where vendors of fresh produce, flowers, meats, cheeses and other foods do roaring business. There are tons of food and drink options in the market. We saw soups, Mexican food, curries, seafood, and juice and coffee places. We got delicious scones and foccacias at Terra Breads, and sat outside to eat and watch the boats. Be mindful of aggressive seagulls if you sit outside! Science World at Telus World of Science is located at the end of False Creek. The geodesic dome is stunning both in the day and at night, when it is lit up. The museum of science, technology and natural history is fun for everyone, with lots of interactive/hands-on exhibits and an IMAX theater. We loved the Illusions gallery, which has optical illusions and effects, and Eureka, where you can explore the science of water, light and sound, among other things. Vancouver’s VanDusen Botanical Garden is beautiful any time of year. Be sure to visit the cool Elizabethan maze, made out of 3,000 pyramidal cedars; it will keep you occupied for a while. A stone garden, a rose garden, the Japanese maples area and a Korean Pavilion are other beautiful features worth exploring. The gardens cover 55 acres and there’s a lot to see so plan on spending a few hours. I highly recommend a guided tour with a volunteer: we took one in a motorized golf cart and received lots of interesting information on the plants as well as the history of the gardens. Guided tours are also offered on foot. Just a three-minute drive from the botanical gardens is Queen Elizabeth Park, another gorgeous green space. It has a rock quarry garden and a rose garden, and I thought the floral displays were stunning. It has multiple levels, and the higher levels offer gorgeous views of the city and the mountains. Queen Elizabeth Park should definitely be on your list of the top ten things to do in Vancouver on your first visit! There’s ziplining if you are feeling adventurous, and Bloedel Conservatory has lots of birds and exotic plants and flowers. Queen Elizabeth Park is free to enter, but there’s a fee for the Conservatory. If you are visiting Vancouver for more than a couple of days, you can explore areas a little further away. Head to North Vancouver and explore Deep Cove. Or spend a day or part of a day hiking in Lynn Canyon Park. Here you will find a suspension bridge that is free of charge, as well as miles of hiking trails. And if you have a whole weekend to spare, try some weekend trips from Vancouver! We stayed at the beautiful Rosewood Hotel Georgia. It’s located in the heart of Downtown Vancouver right across from the Vancouver Art Gallery. Beautiful bathrooms, comfortable furnishings and old world charm. And the Bel Air Cafe downstairs sells the most delicious macarons! I loved our two stays here. Other nice downtown options: The Fairmont Pacific Rim and the Wedgwood Hotel & Spa are both in Downtown Vancouver and have great reviews on Trip Advisor. Vancouver has so many world-class restaurants that you will have no difficulty finding great places for every meal. My picks? I loved our meal at Vij’s, the iconic Indian fine dining restaurant. Lunch at Nightingale, Chef David Hawksworth’s casual eatery, was fantastic. We eat at Acorn, the all-vegetarian restaurant on Main Street, every time we visit Vancouver, because the food is so outstanding. Breakfast at Cafe Medina is a must, even if it means giving up some zzzs and waiting in line. There’s no bad time to visit Vancouver. It’s truly a destination for all seasons. But if you were to twist my arm, I would recommend you choose early fall for your first visit. The changing leaf colors, balmy weather, and still reasonable daylight hours make fall a gorgeous time to be in Vancouver. So there you have it…my list of top ten things to do on your first visit to Vancouver! If you haven’t visited, it’s truly worth adding to your list. What is your favorite city to explore? Comment below with recommendations! I’ve been wanting to get up to Vancouver! Your top 10 is right up my alley, I’d be biking that seawall, one of my favorite things to do in a city! Great post and photos Dhara, I’d probably want to spend a week there. Thanks, Rebecca! You’ll have plenty of options to keep you busy for a week in this beautiful city! The Seawall around Stanley Park has stunning views. You’ll love it! The parts of Canada I have visited so far have been spectacular…can’t wait to explore more! Wow, your article and pictures are amazing! I love the lookouts and the beautiful city view. Vancouver hasn’t specially been on my bucket list but now it is! That’s great to read, Karo! Vancouver definitely deserves a spot on your list! It is a beautiful city! Vancouver will always hold a special place in my heart. It’s such a gem. Thanks, Kathryn…it is such a lovely city. I am hoping I get to visit again! Love the tips! Definitely wanna go someday! It’s definitely a city worth adding to the list! I’ve always wanted to go to Vancouver. Thanks for these tips! 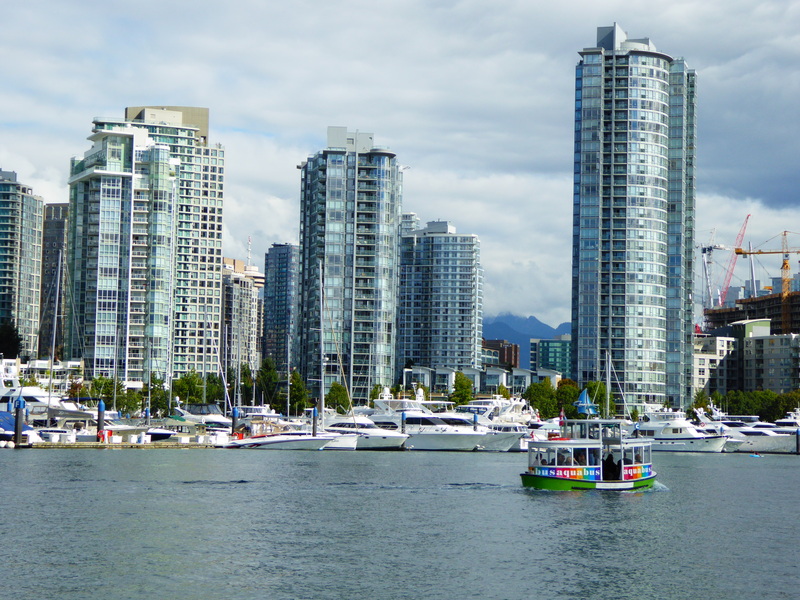 Vancouver is a wonderful addition to any travel list! You will have fun when you visit!